Based Sydney, New South Wales, Australia. Game Show Entertainment is not just for television anymore! Now you can catch all the excitement at your own parties and company events with Game Show Mania! We provide everything except for the contestants. Our high tech mobile game show includes buzzers, digital scoring, real lockout functions (just like on TV), jingles and more. The Game Show can include as little as two competitors, or as many as 60 guests directly, whilst having the remaining guests cheering them on from the audience. Up to 3 competitors per team (up to 3 teams)play over 4 rounds, additional competitors can be utilized using the "phone a friend" option, or the "comical challenges", so the choice of how many audience members are directly involved in the Game Show is essentially up to you, the client. Full of fun and excitement, the Classic Game Show uses high tech gaming systems and a comical host to bring all the glitz and glamour of a real life TV Game Show entertainment to your next event. Perfect entertainment for corporate events and functions, the Classic Game Show can be played with as little as two or includes as many as 47 people and promises to be something completely different that they'll be raving about for months! Our state-of-the-art gaming systems can go wherever there is electricity and are set up and operated by one of our professional technicians. These gaming systems include stand-up player podiums with buzzers, lockout capability and player microphones, as well as electronic digital scoreboards and lighting. The Game Show team can also supply a portable sound system to ensure you get the full experience with our authentic sound effects, clips, show music and more! The opportunities are endless when it comes to the questions in the Classic Game Show. The Game Show team have thousands of generic questions ready to go based on everything from entertainment and sports to history and famous people, or to add a personal touch for themed or corporate training days we can include theme or company specific questions to really put your players to the test! The questions are a mix of complete answer, multiple-choice, true or False, fill-in-the-blank, sound clips, and to really add to the action and excitement we can even thrown in some of our highly entertaining comical challenges! Email us to find out how you can have this award winning entertainment at your next event! In our version of the popular TV game show two teams go head to head to name the most popular responses to questions already answered by a survey of 100 people! A game that can be played with any two teams, from families right through to corporate groups, Fantastic Feud asks not what is true, but what other people think is true! Prepare yourself for anything as teams get perfectly logical answers incorrect or crack under pressure and respond with answers that will leave the audience in stitches! For general event entertainment the Game Show team can bring their own questions and survey responses along or, to turn Fantastic Fued into your next corporate event entertainment solution, a themed or company specific survey can be generated to be relevant for training or team building. With high tech player podiums, including a specially designed "Face Off" podium, Fantastic Feud is a fun, different and truly entertaining game where anything can happen! Your guests will become ROCKSTARS in this fun & musical game show. Contestants make their way through eliminations based on their ability to sing the correct lyrics, fill in the missing words, and unscramble the mixed up chorus as presented on the big screen behind them. This game will have your entire audience rockin'& boppin to the beats! Trivia style, and multiple choice style questions Incorporation, where necessary, of company-specific questions. Recommended performance space: 1 table, approximately 2m long. Package rates for week long events & multiple shows are available. 2 x 250waat speakers with XLR inputs or we can provide for added cost. Freight & travel costs if applicable. "Lockout Plus" technology, digital scoring, lights, buzzers. Recommended performance space: Minimum of 4m wide x 3m deep. Your choice of Classic Game Show, Fantastic Feud, or Bee a singer game formats. Incorporation, where necessary, of company-specific questions. Sound clips "Name that tune"
One hour pre-chosen music for guests to enjoy & dance away after the Game Show ends! Our event was excellent, the only complaint was that it was over too quickly..lol. The presenters were very professional and entertaining and everyone commented on such a great party. We will have to try one of the other themes next year for sure...Many thanks for all your help in organising for us. 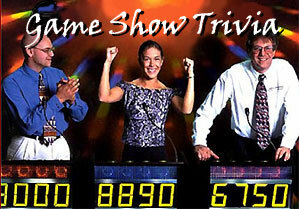 Jill Connell, Technology One Corp.
Game show trivia is fun entertainment and ideal for effective team building.